So If Money Doesn't Buy Happiness, What Does? Money is great, up to a certain point. 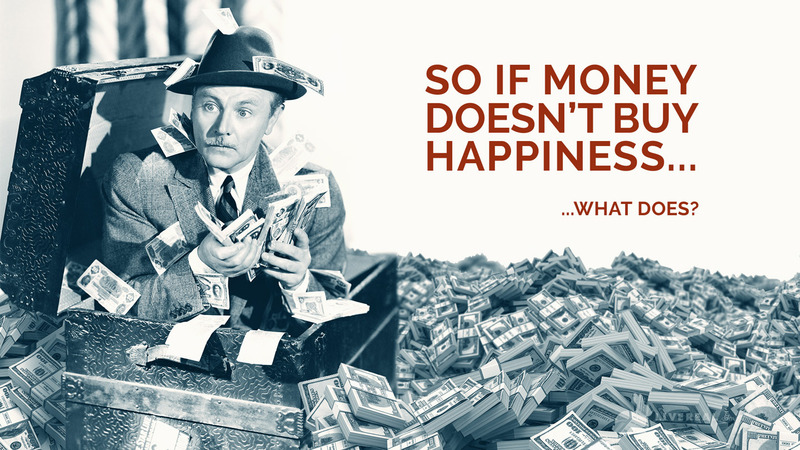 So, if money doesn’t buy happiness…if money isn’t “IT”…what is? Well…status. Fame. Status. Wealth. Fancy cars. Career success. Designer handbags. Becoming a bigshot. Getting tons of fake social media friends. Etc. At this point, we’ll skip ahead to the back of the book, and just say it: fame, status, wealth, fancy cars, career success, even designer handbags, becoming a bigshot, even having tons of fake social media friends…these can all be great, sometimes, and every so often, even downright awesome. But it doesn’t buy happiness. It isn’t “IT”. If you need proof of that, just go find anyone with any of things, and chances are, sooner or later, you’ll very likely find someone who has it and is still miserable. They can satisfy us for a while. But then eventually, with enough time, if we’re honest, we often experience something like…wanting more. Meaning, we don’t stay satisfied for long. - which could mean that what we were truly searching for was something entirely different. We’re searching for something that truly satisfies us, in a lasting way. Something that, once we experience it, means we don’t have to go searching for anything else after it. So treat this as a hypothesis. Observe everyone around you. Do folks who attain status, fame, wealth, fancy cars and so on stay satisfied for long? Do they seem to have found “IT”?